Hi there, how am I finding you all? Happy? I do hope so! I'm rather excited this week as I've got a lovely wedding to attend on Saturday. My niece is getting wed and all the family will be dressed up to the nines and enjoying a fabulous gathering - who doesn't love a good old shin dig? We've done the Hen Party - catch a little of what we got up to here., the guys have been on the Stag weekend (the least said about that the better lol), outfits prepared, marquee is up, food is ordered and the party is very nearly about to get started! I can't wait, having a bank holiday next Monday we'll be partying for a long time - so lets hope the shoes are comfortable!!! Another busy weekend has just finished for me, with a festive family function at my mum's house - the reason being ... the reason ... well just because!! We've got a close family on both sides, taking the time to get together as often as we can, and with so many of us there's nearly always a birthday to enjoy at least once a month, sometimes twice! It just so happened that there was an Air Show on the same day, so we got views of the various air machines that were in the skis - some rather noisy, but a great display none-the-less! 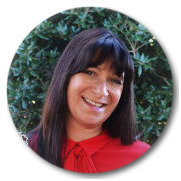 Turns out that fellow blogger Claire Justine was watching too, shame we didn't know, maybe we could have met up to say hello in person - I've not met another blogger yet - have you? Yesterday hubby and I finally used our Christmas present from our daughters. I've always wanted to visit the London Eye, so on Sunday I finally fulfilled my wish and took a flight on the worlds largest cantilevered observation wheel. Launched in 2000 it has won over 85 awards for national & International tourism along with outstanding architectural and engineering achievement, and is in fact now become one of the UK's most popular paid for visitors attraction. The views were simply stunning, we could see for miles, and with the help of the little map we bought, also able to establish where everything was. We only actually queued for about 45 minutes for the ride having already got pre-paid tickets. To purchase tickets on the day you're probably looking to wait another half hour (depending on the day and weather). Included in this is a visit to the 4D Cinema Experience, a 4 minute video showing a birds eye view of London, the London Eye and various other monumental landmarks, with the free 3d glasses you really feel you're flying over London - in all weathers!!!! Anyway lets get to the nitty-gritty - August's Style Steal! You may remember last month I started a monthly addition to my blog where I'd steal a style from another blogger & try to re-create it. You've arrived just in time for the August Style Steal! How did that come around so quickly? Did you manage to see my first challenge? 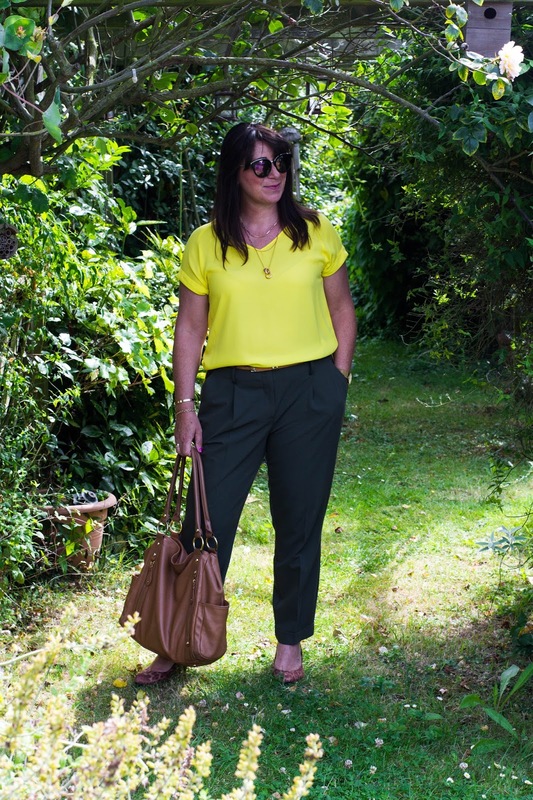 Check out July's Style Steal from Catherine - Not dressed as lamb - here. X I'm running this on the third Monday of the month, and I'd love you to pop back each month to see who's look has been 'copied'. Stealing my style from the gorgeous Rachel from Rachel the Hat. I love just about everything in her laid-back outfit. The cool way the whole outfit blends together, showing off the cute leopard print clutch bag to perfection. & that belt, oh that belt - it's a super addition matching those crossover tan sandals. I've worn these khaki peg trousers with a camouflage top and also dressed up here. 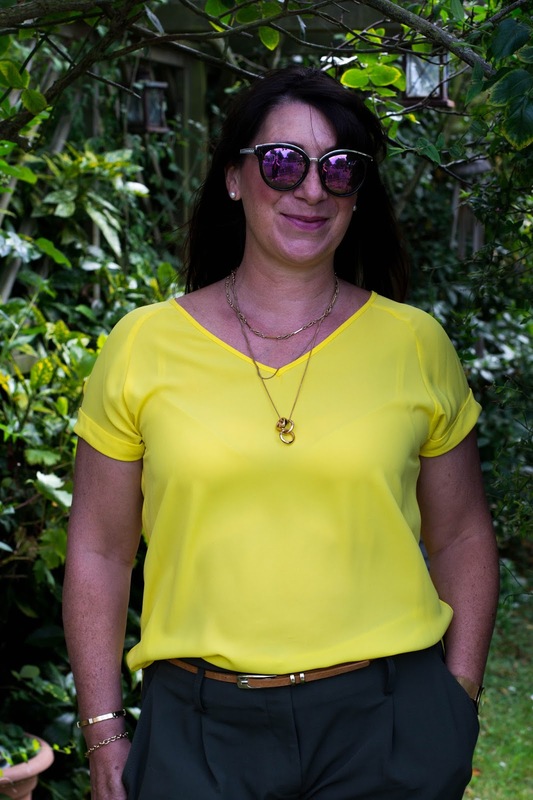 Having already got this yellow silky top hanging in my wardrobe the copy had evolved from clothes I already own. My belt slightly different - no tassels - boo! I'm on the lookout for one similar to Rachel's, but happy with how mine looks to be fair. Swapping in my TK Maxx big tan bag, but again I'm searching for a leopard print clutch - seeming to be a difficult bag to find, can't even find one in my favourite shop - TK Maxx aren't coming up trumps with any yet! My pop of leopard print came from these M & S court shoes - very old, but very useful! 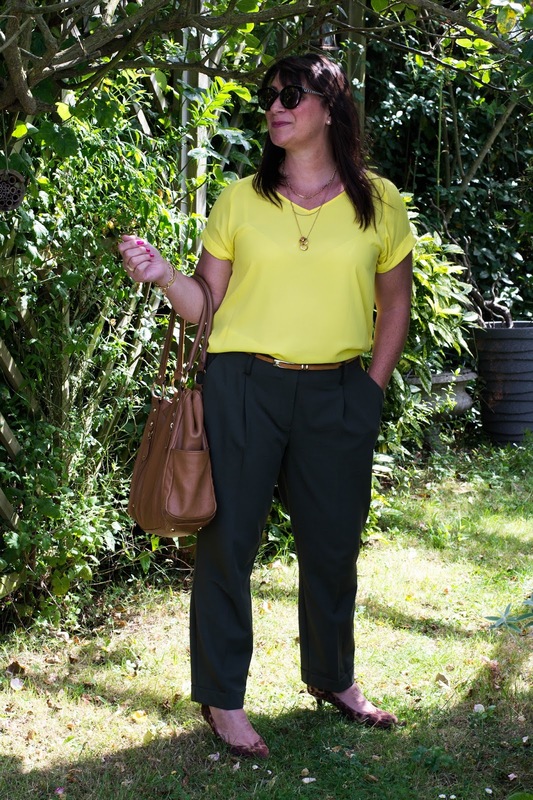 Peg trousers from Dorothy Perkins Similar here. 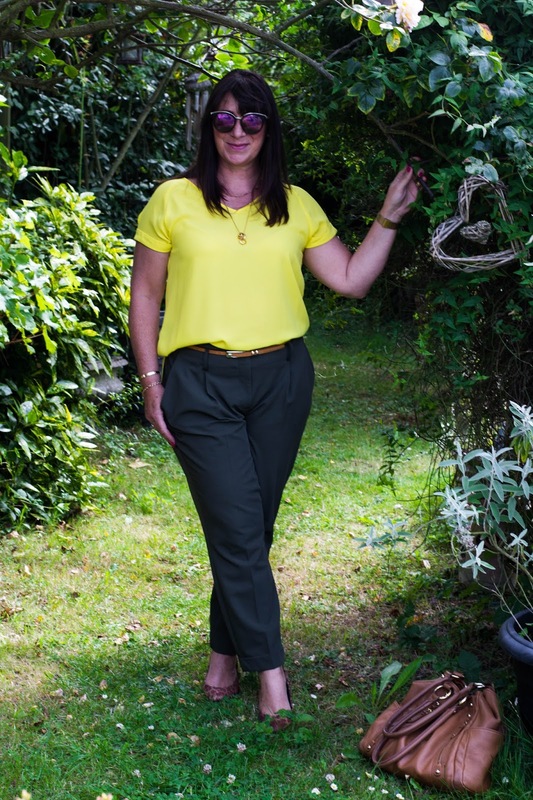 Yellow silky top from Matalan love this. Bag from TK Maxx in love with this. Shoes from M & S these are cute. It's fun to try a style steal, I wonder if you've tried this before? I'd really be interested to hear if you have, hope you can share with me. Until Thursday, thank you so much for visiting - it's been a pleasure. Linking up with Not Dressed as Lamb. 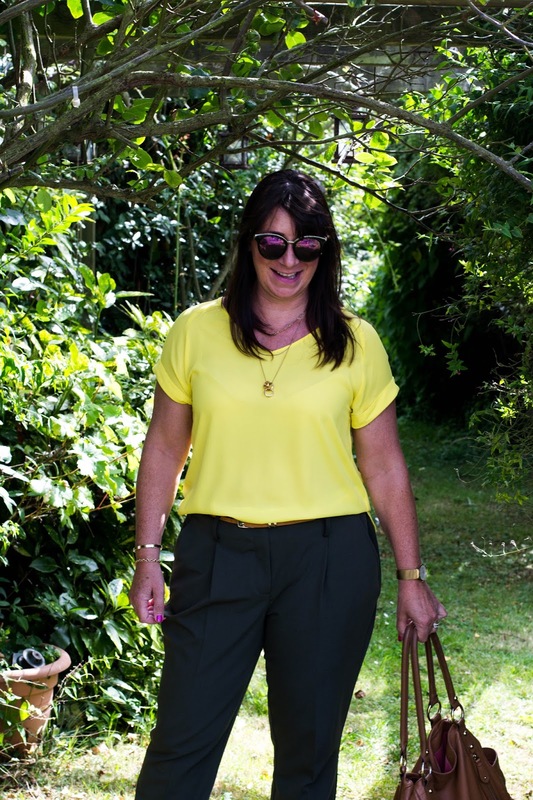 Great steal Jacqui -that yellow is so great on you! Wow, you'beautiful babe, do you ever look beautiful in yellow! Gosh, I love a good deal! Pretty as can be! You look fab in yellow. I know a lot of women are affraid of yellow but I persoanlly love it too especially for summer. Love your whole look :) Great style steal! That's such a fun idea! You both look great in your outfits! Perfect copy Jacqui. I think it's great fun doing steals, or Beings as Mary and I call them. Catherine should be pleased with this. I like how you added a cheeky bit of leopard too! Thank you so much for sharing it at #fakeituntilyoumakeit. Jacqui, how have I missed your style steal posts?! What fun! I love this idea as am always so inspired by the wonderful styles of other bloggers. And Rachel the Hat is ever so stylish! You look marvelous in your interpretation of Rachel's look! I love the leopard shoes added to this look. So great! And what a shame that you missed Claire Justine. 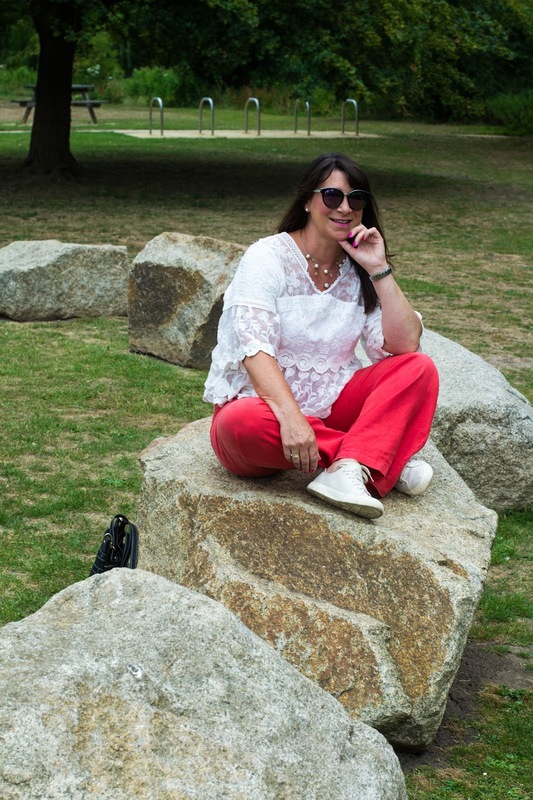 I have had the great pleasure of meeting 3 bloggers in real life and what a rush! It is so fun to meet in person after getting to know these fabulous women online. I do hope you get the opportunity soon. Thanks so much for joining my #SpreadTheKindness link up!